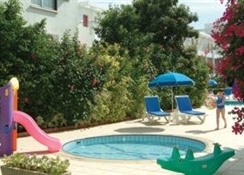 Nissi Park Hotel is well positioned within Ayia Napa. It provides quick and easy access to one of Cyprus’s finest beaches in the form of Nissi Beach which is a fine white sand beach. Nissi Park Hotel is reachable from Larnaca International Airport in little more than half an hour. Accommodation at the hotel features beautifully decorated rooms with modern conveniences for a comfortable holiday. 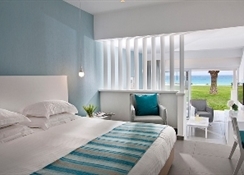 At Nissi Park Hotel’s sister hotel, Nissi Beach Resort, guests will be able to access an exciting array of recreation activities such as archery, tennis, beach volleyball as well as numerous water sports including water-skiing and parasailing among others. The main restaurant caters to both international and local tastes with a beautiful courtyard to look out onto as you dine. Around the hotel, you will find restaurants serving cuisine from around the world as well as a number of tavernas where you can try authentic Mediterranean dishes. Of course, there’s also Ayia Napa’s famed clubbing scene where a stroll around central Ayia Napa will take you to many exciting nightclubs. Nissi Park Hotel lies just 51km east of Larnaca International Aiport and can be reached by car in little over half an hour. The golden sands of Nissi Beach are less than a five-minutes walk from the hotel. There are several restaurants around the hotel that can all be easily walked to. Ayia Napa’s waterpark is just 2km away and takes a mere 5-minute drive to get to. Stathis Shopping Center is ideal for food and retail shopping and is just 1km from the hotel. Central Ayia Napa is approximately 5km east of the hotel which translates into just a few minute’s car rides. Once you reach the centre you will find museums, cash points, food shopping, souvenir shops and many nightclubs. Accommodation at Nissi Park Hotel is a pleasure to stay in with lovely interior décor, attractive furnishings with an elegant Mediterranean colour scheme. There are 80 rooms at Nissi Park Hotel, all of which feature essential facilities for a relaxing stay such as a private balcony, air-conditioning, TV, safe deposit box and mini fridge. 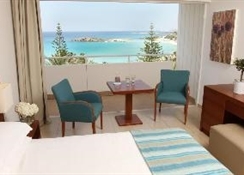 The rooms at Nissi Park Hotel overlook a mountains view and can sleep up to two guests on a double bed. Enjoy dining in at Nissi Park Hotel by experiencing the fine dining options available to guests. The main hotel restaurant offers guests a variety of local and international dishes whilst providing beautiful views over the courtyard garden and serves breakfast, lunch and dinner. Snacks and refreshments can be had at the Hotel Bar and Coffee Shop which offers shaded al fresco dining under the stunning bougainvillaea trellises. Around the hotel, there are many more fantastic bars and restaurants. Nissi Bay Beach Bar is an ideal stop as it resides within easy walking distance of the hotel, has a wide selection of beverages and sits right on the coast where you can have a drink whilst overlooking the clear Mediterranean waters. Nissi Park Hotel has an outdoor swimming pool with loungers on the sun terrace. There is also a shallow water pool for children. As a guest of Nissi Park Hotel, you will also get access to the variety of exciting recreation activities at the sister hotel, Nissi Beach Resort. These include tennis, beach volleyball, archery and water sports such as jet-skiing and parasailing among others. Nissi Beach is the perfect place to relax under the Cypriot sunshine with its fine white sand. Children are well catered for with their own pool, play area and daily activities available through the Kids’ Club. If you’re looking to party the night away, then head into central Ayia Napa where there are many nightclubs which await you.